Professor Freeman discusses the debate over the Constitution at the Federal Convention of 1787 - a convention that by no means had an inevitable outcome. Indeed, even attending the Convention at all was a subject of debate in the individual states; many people feared that the Convention would produce a pseudo-monarchical form of government that would abandon the true significance of the Revolution. Ostensibly called to revise the Articles of Confederation, the meeting ultimately produced an entirely new form of government, in part, thanks to the influence of James Madison’s “Virginia Plan” of government. 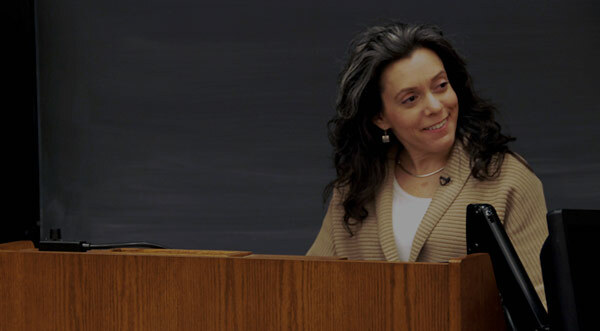 Professor Freeman focuses on three subjects of debate among the many that occupied the Convention: the debates over representation, slavery, and the nature of the executive branch. Professor Joanne Freeman: Before we begin, I have to make a true confession to you, my class, because you’re my class, and I have been confessing things all semester but this is — I basically set myself up for this failure and then realized — at the end of the class someone came up to me and asked me a question, and then I realized — Gaa! Okay. So remember how I told you how at UVA for five straight years I forgot Thomas Jefferson’s birthday, even though everything closed? Yeah. Guess what I didn’t say on Tuesday? I forgot it was Thomas Jefferson’s birthday. [laughter] I completely forgot. Someone came up at the end and said, “Well, in honor of Jefferson’s birthday we did the following” — and I was like [laughs]. So it’s good to know that I’m really consistently a horrible UVA grad [laughter] who always forgets Thomas Jefferson’s birthday. It must be a Hamiltonian mental block [laughter] that I — it is not possible for me to keep that date in my head. Anyway, I at least wanted to say, happy birthday, Thomas Jefferson. So now, officially, I’m a little late, but he’ll get over it — so anyway [laughter] I’ve confessed to you. I feel much better now. Okay. So today we turn to the Constitution. In the last few lectures and in today’s lecture basically we’ve been looking at the new nation figure out its shape and form, right? — what kind of a nation is this going to be. As people were discovering throughout the 1780s, it was one thing to protest against things that you didn’t like in a government, as the Americans had during the Revolution. It was quite another thing to come up with an alternative, to come up with something better and then to get others to agree. Today’s lecture, I’m sorry — Tuesday’s lecture discussed part of this process of figuring out the shape and form of the new nation. So we looked at the Mount Vernon Conference, we looked at the Annapolis Convention, and we — in doing that, we’re looking at a gradual process that was unfolding one step at a time with no inevitable outcome. So basically, what we saw on Tuesday was how the Americans were basically backing their way into what would become the Constitutional Convention. So it’s not as though everyone said, “Hey, we need a new constitution and it’s got to be stronger. Let’s go.” Right? They’re — It’s a process at which people are really figuring things out as they go. And today I want to stress that same message: that the Constitution was not inevitable. And I know that’s obvious on the one hand, but on the other hand, it’s so ingrained in us, I think, to think that it’s a great idea that of course would happen sooner or later, that I feel the need at the outset of the lecture to say this, that obviously it was not inevitable. We think to ourselves: well, of course the Articles — what a goofy government the Articles of Confederation was; of course they’ve got to come up with something better; of course it’s going to be stronger; of course it’s going to end up looking like our Constitution. And obviously the problem with that whole river of “of courses” is that if you travel down that stream you miss one of the most important aspects of the process of creating the Constitution, and that is that it was a process, that it was a debate. It was a national debate during which people really seriously considered what they were doing, what the implications were of what they were doing, and they did not all agree on what was a good or bad idea. So the process, the fact that there actually was a debate, is significant. And it’s not a process that was entirely disconnected from the Revolution. The things that Americans had been yelling about during the Revolution — right? — they talked in a variety of different ways about liberties; they talked in a variety of different ways about rights — that wasn’t just rhetoric. People were truly arguing about and defending specific fundamental rights and privileges that they felt they deserved as British subjects, and of course the end result about that fight was the Revolution. So now we’re years later, and we’re looking at arguments over a new form of government, and some of these same things are being yelled about. So, as you’re going to see in the course of today’s lecture, in one way or another people are still fretting about sort of what they consider to be fundamental liberties, basic rights. People considered these things to be the legacy of the Revolution and they didn’t want to give them away before they’d even really begun to enjoy them. So think back for a minute — many moons ago; it’s so long ago in the semester — but think back to when we were talking about the vote for independence, and I mentioned Pauline Maier’s book. And I talked about how in her book she has a chapter in which she talks about the other declarations of independence, and she really shows how on a local level people were getting together and debating as groups in towns, in counties: what do you think about independence and should we actually support this? — that that was actually a real debate. And what I’m talking about here, what I will be talking about over the course of this lecture, it’s a similar process of debate in which people throughout the country were really trying to figure something out. They knew it was a major decision. They were hoping whatever was going to happen was going to be a smart decision, but it’s an actual debate. And along these lines, as you’ll see by the end of today’s lecture, this is not the kind of lecture in which I’m going to give you this deep textual analysis of the Constitution. Basically, I’ve got this lecture and a little bit of the next lecture to talk about the Constitution. I’m sure the Founders are spinning in their graves like: “what, forty-five minutes to give to the Constitution?” — but that’s where we are in the semester. Given that I only have that amount of time, what I really want to focus on is the process of creating the Constitution, and in doing that I’m also going to talk about a handful of ongoing controversies that we have seen before during the Revolution in an earlier part of this course, and we’re going to see them again toward the end of this lecture when we focus on some of the main areas that became controversies for the Constitutional Convention. Now I think in the same way that we have all these “of courses” — of course we know what’s going to happen, it’s the Constitution — I think it’s also easy for us to walk down the “of course” trail when we think about nationalists like James Madison or Alexander Hamilton. On some sort of basic level, we assume well, they’re right, right? They’re the smart guys; they’re right, and anyone who is against them is sort of a shortsighted, limited-minded person who clearly isn’t thinking on a broad, smart level. Right? I think almost instinctively because we think what we think about our Constitution, we think that way about whoever supported it or did not. Now certainly, these nationalists felt like they were vindicating the Revolution, right? So if you’d asked them, they would have told you that they felt they were preserving the achievements of the Revolution; they were fending off chaos and a variety of other things that would defeat what had been won in the Revolution. And from our vantage point, we can look back, we see that, and that makes sense, but this wasn’t the only argument that was circulating at the time. So even before the Constitutional Convention met, people had valid fears about what might result from it, and they were fears that were strong enough that some people didn’t even think their states should participate in the Convention. Never mind arguing about ratification. I’m backing us way up. There were many people who just thought: ‘I don’t want to — I don’t think our state should participate in this whole idea of revising the government.’ In some way or another, some people feared that strengthening the national government was a kind of counterattack against everything that the Revolution had meant. And I want to give you a sense of the flavor of this debate, this actually sort of pre-Convention debate in which the states are figuring out what to do, and I’m going local again. Right? I sort of — To give you a sense of on-the-ground reality during the Revolution, I went local when I talked about the invasion of New Haven. So for just a couple minutes here I want to go local again and just give you a flavor of the debate that was going on here in Connecticut after the Confederation Congress had passed a resolution saying: okay, we think that the states should select delegates to send them to this Convention that’s going to happen to revise the articles. Right? They’re not saying, ‘Go destroy the Articles’ — but they are saying, ‘Okay. Revising the Articles might be okay’ — and once the Confederation Congress makes that resolution, the states now debate what to do. So on May 12, 1787, the Connecticut legislature began debating whether Connecticut should send delegates to this proposed Convention to meet in Philadelphia that was coming up in a couple of — was coming up very soon as a matter of fact. Now most newspapers that reported on what happened explicitly mentioned four members of the Connecticut House who came forward and declared that they were opposed to sending delegates to the Convention. All of these men were from small towns near the Massachusetts border. And all of them in one way or another warned that sending a delegate to this Convention would endanger the liberties and privileges of Americans. So Elijah Fitch — I love the fact that their names are preserved — Elijah Fitch said the Convention might end up abridging the people’s privileges by creating some kind of a big, unjust, centralized government that just wouldn’t consider the individual person at all. Daniel Perkins said that the men who probably would be named as delegates to this supposed Convention would probably be a bunch of rich, aristocratic-type men who wouldn’t understand or care about the problems of the average person in Connecticut, never mind the poor of Connecticut. So Perkins thought, whatever comes out of this Convention is bound to just ruin the poor; it’s going to be some weird, aristocratic decision. Hosea Humphrey said that the Convention would probably somehow or other take away the rights of Connecticut to protest against things, to veto things; somehow or other it’s going to be more centralized, so Connecticut is going to lose power in this equation. And the fourth representative, named Abraham Granger, was particularly straightforward. He said, he knew that his constituents didn’t want delegates to be sent to this Convention and he represented them, so first of all, there it was. He had no choice; he had to just do what they wanted him to do and say, ‘No, we should not send delegates to the Convention,’ but he added, he agreed with them. He actually thought that this Convention was a bad idea, and he stated specifically, the reason why he didn’t like the whole idea of a Convention was probably it would end up creating a monarchy, and then we’d be right back to where we were before. So all of these men, either directly or by implication, clearly they’re rejecting the idea that the Union or Connecticut is in such horrible shape that something must be done; we need a new government. They’re not traveling down that trail. Granger actually in the course of his remarks explicitly said that the Confederation Congress had plenty of power; the Articles of Confederation joined with Connecticut’s own constitution would be just fine for the people of Connecticut. Implied in some of the comments of what these men said is the idea that anything could happen at this Convention, and obviously that’s something I’ve talked about before in this course as well, but you can hear it underlying a lot of their comments. Who knows what’s going to come out of this Convention? Anything could happen and odds are whatever happens, some fundamental American privileges and rights are going to be taken away, potentially by a bunch of wealthy, aristocratic guys who are going to be the ones standing in that room in Philadelphia debating. So they’re basically imagining the Convention’s going to be a bunch of aristocrats who are going to subvert a popular revolution and maybe even just toss the new country right back into a monarchical form of government. So those are the four people who at least the newspapers noted as really standing forth against the Convention. So obviously in the end, it’s that kind of an argument that wins out and Connecticut voted to send delegates to the Convention, but obviously also not without a real debate. So even participating in the Convention was a big deal that required serious debate, and we haven’t even gotten to ratification yet. As a matter of fact, it was such a big deal that one state, the state of Rhode Island — Rhode Island is consistent throughout my entire class — Rhode Island decided not to attend. They actually just decided: no, we’re not participating, we’re not going. So there were actually only twelve states represented at the Constitutional Convention. Rhode Island was a holdout. So clearly, so serious that one state is just not there. So ultimately twelve states sent delegates to the Federal Convention. And I should add here, just to not confuse you, sometimes I know I’m saying Federal Convention and sometimes I’m saying Constitutional Convention, and they’re two ways of referring to the same thing. Some historians say Federal Convention because if you think about it, every state could have a constitutional convention but there can actually be maybe, hopefully one Federal Convention, but you can use either one. You have my full permission to call it either the Constitutional Convention or the Federal Convention. So twelve states sent delegates to the Federal Convention. It met between May and September of 1787. Rhode Island obviously, as I said, was not there. From those twelve states, fifty-five delegates attended the Convention in all. And I suppose, as you might expect, overall they were well-educated men. A lot of them were trained as lawyers. A lot of them had experience working in their state governments. A good number of them had experience serving in either the Continental Congresses or the Confederation Congress. Now that said, this doesn’t mean that these were sort of professional politicians sitting down to write a constitution. It’s not as though they’ve prepared their lives for this moment. They’re people who’ve been involved in public life but they certainly have not been training to sit down and create an entire constitution for a whole country, so despite that experience, which I’m sure served them well, it does not suggest that they actually are just ready to go. They’re not entirely sure what’s going to happen. Now in some ways, these delegates were kind of a self-selecting group, because people who were really dead set against the idea of strengthening the national government basically just didn’t go to the Convention. The problem with that strategy is — on the part of certainly the people who didn’t like this whole idea — by not being there, they made it easy to achieve a consensus among the people who were there who were a little more comfortable with strengthening the national government. Most of the people who were there in one way or another ended up being nationalists in some form, and by nationalists I actually don’t just mean the James Madisons of the world. There’s a pretty wide spectrum of people thinking about the fact that the national government needs to be stronger and some of them, Hamilton, Madison, extremo nationalists, others not so much — there’s a pretty wide range — and there were some people at the Convention who weren’t even necessarily comfortable with a great amount of increased strength and did not end up signing the Constitution. So I’m not saying everyone there is a firm nationalist. But the really firm, I suppose you’d call them at this moment anti-nationalists, didn’t go for the most part. So since they were not there, it meant that there was a certain sort of fundamental level of agreement at the Convention. Now two of the delegates there were particularly well known, and to people who were wondering what the heck was going on in Philadelphia, the presence of these two men made a big difference. George Washington. George Washington was there. George Washington ended up presiding over the Convention, which ended up being a pretty important move. I’ve already talked in past lectures about how he gained the trust of everybody by continually surrendering power, so he’s already a legend in his time, but also he’s a trusted leader. So certainly having him there gave a certain status to whatever was going on, meant that it was important, and meant that it was something that was being treated responsibly because George Washington had invested it with his presence. Benjamin Franklin also attended. Again he’s another man in this period that — an American who had an international reputation. I’ve talked a little bit about him as well, and like Washington his presence there suggested that whatever the heck was going on in Philadelphia, it was important and it had some major support. The fact that these two men were there was significant. This is not the reason why he was there, but I also am always happy when anyone is anywhere who has a sense of humor, so Franklin had one, and it’s always good to have the guy with a sense of humor at any large meeting of men who have important things to say. So for that reason I personally am happy that Benjamin Franklin was there. Now as I suggested on Tuesday, Madison also played a major role, and I talked at the end of Tuesday’s lecture about his amazing notes that he recorded partly thinking ahead to posterity. His notes ended up being even more significant because it was agreed at the start of the Convention that its proceedings would be kept entirely secret. The logic of that being that if it was really, really kept entirely secret, the people who were there would feel free to really speak their minds. They really wanted an open, full, honest debate, so if people there really believed that the public would not know what they were saying, someone for example might feel free to stand up and say, ‘I personally would like a monarchy.’ Right? If people thought the public was watching, no one’s going to utter the “m”-word at the Constitutional Convention, but if it’s really secret, the idea was it would allow for much more open and free and potentially useful debate. and then he said “but there it is,” and he sort of threw it down on the table and added, “Let him who owns it take it.” And according to Pierce, he bowed, picked up his hat and left the room, quote, “with a dignity so severe that every Person seemed alarmed.” Okay, the power of George. Right? He just sort of threw his weight around and everyone’s like: uh oh. So Pierce writes that immediately everyone started checking their pockets and their notes, like: ‘I really hope those are not my notes; please don’t be my notes.’ Pierce says to his horror he discovered that his were lost, so he kind of goes up to the front of the room, and he kind of peeks at the notes and he’s really relieved to discover: they’re not mine. Okay. That means that his notes are lost; [laughter] that means two people’s notes are lost. And Pierce then later says that he remembered, oh, yeah, I left them in my coat pocket in the boarding house where I’m staying — and he found them and got them and hopefully everything was okay. But I love the fact that he’s really relieved like: oh, good, at least those aren’t my notes; they’re someone else’s really lost notes. And according to Pierce, Washington’s reprimand was so off-putting that nobody ever claimed the piece of paper. [laughter] It will just stay there, [laughs] the scary piece of paper. So obviously Madison’s notes are important also partly because this was very secret, but of course, as I hinted at the very end of Tuesday’s lecture, what’s particularly significant about Madison’s role in the Convention is his creation of a plan of government which ultimately is known as the Virginia Plan. Madison arrived at the Convention with a plan of government in hand, so in a sense he immediately set the terms of debate. It was a really strategic move — and I’ll add at this point that when you go off in to the future and have wonderful jobs that in one way or another will require you to have committee meetings of various sorts, the little lesson, the life lesson that James Madison teaches us here is, if you set the agenda of the meeting, you set the terms of debate and you make it much more likely that you win. Right? So remember James Madison down the road in your professional lives. He really does something very brilliant strategically by walking in and regardless of what is going to happen — he doesn’t know what’s going to happen, but he literally at least started out by setting the terms of debate. Now he may have devised this plan of government, but given that people already knew he was sort of an extreme nationalist, he wisely decided he would not stand up and present this plan himself, thinking — and probably rightly so — that if he stood up and made a recommendation, some people would immediately distrust it as coming from some kind of an extreme nationalist. So instead, he asked fellow Virginia delegate Edmund Randolph to present the plan. And Randolph was popular and Randolph was influential and unlike Madison Randolph was also a good public speaker so it was a wise choice. So on May 29, just a few days after the Convention opened, Randolph stood up and very diplomatically and very gently opened the subject of altering the Articles of Confederation. Though, as you’re about to see, what he ends up suggesting is not altering the Articles. So first he reviewed the weaknesses of the Articles, and then he proposed a series of resolutions, the first one intended to just calm the nervous down and sort of put people off guard: nothing scary is happening here. So he first says, “Resolved, that the Articles of Confederation ought to be so corrected and enlarged as to accomplish the objects proposed by their institution; namely common defense, security of liberty, and general welfare.” So Randolph there says he’s proposing to correct and enlarge the Articles. What followed that statement was a rather radical plan of government that was not a correction of the Articles. Instead it pretty much proposed to demolish the Articles and create in their place a strong national government that would be grounded not on the individual states, but instead on the people themselves. This plan of government — the Virginia Plan is ultimately what it’s called — proposed that the new government would have three branches. The first would be a bicameral legislature. The lower house would be elected by the people. The upper house would be selected by the lower house from candidates named by state legislatures. The legislature would have the power to nullify any state law contrary to the Constitution, and representation — as I mentioned — in the lower house is based on population. The second branch was the national executive. In the Virginia Plan, the executive would have a qualified veto over acts of Congress. The plan didn’t specify whether the executive would be a single individual or a committee. People talked about both. The term of office wasn’t specified either. And then obviously, the third branch was the national judiciary, which would consist of one or more supreme judges and some inferior courts, to be chosen by the national legislature to hold office during good behavior. So I’ll repeat that: Bicameral legislature; lower house elected by the people; upper house selected by the lower house from candidates named by state legislatures; the legislature can nullify any state law that violates the Constitution; representation is based on population. Branch two is the executive who has a qualified veto over acts of Congress, and it’s not specified — one person, many people, how long you should be in office. And then the third branch, the judiciary, with one or more supreme judges chosen by the national legislature holding office during good behavior. The Virginia Plan also included a flexible amendment process and a procedure for the admission of new states. Now, as you can hear there, the basic outline of the final Constitution is kind of sitting there in that plan. A sort of fundamental frame of what’s coming in the next few months is contained within the Virginia Plan. So from the start of the Convention, things look a little auspicious for the nationalists, and sure enough relatively early on in the Convention there’s a vote that a new national government ought to be established and it should have a supreme legislative, executive, and judiciary branch. Now that’s a pretty major thing to decide. It’s a pretty major victory for people who are really firm nationalists; that, okay, the Convention now has committed to setting up a supreme central government with three branches. And some more nationalist victories followed. So for example, the Confederation decided that the executive would be one man after debating this for a while — and I’ll talk a little bit more about this toward the end of the lecture — but they ultimately decided that one man should be the executive, and clearly, in a world where you’re scared of centralized power and thinking about kings, that’s a big decision. And then they began to discuss representation in the lower house of the legislature, and I’m also going to come back to representation in a few minutes. But for now I’ll simply state the obvious, which is: of course this debate broke down — as this debate always breaks down — into small states versus large states, small states not liking the idea of having representation be based on population, large states being perfectly happy with that idea. And small states had a good reason to fear that their influence would just be eliminated in some degree if everything is based on population. So on June 15, William Patterson of New Jersey proposed his own plan, which becomes the New Jersey Plan — it’s another New Jersey moment, the New Jersey Plan — and of course this is a plan that’s much more popular among small-state representatives. The New Jersey Plan suggested a one-house legislature in which obviously each state would have one vote. There would be a plural executive — so an executive consisting of more than one person — who would be elected by the Congress, and a supreme court chosen by the executive. Now you can see how in some ways that there are little vestiges of the Articles sitting there in that plan: there’s a unicameral legislature; each state has one vote. Even so, even though this is supposedly a less centralized, less scary alternative to the Virginia Plan, still it is giving more power to the national government than the Articles had done. Three days later, someone successfully moved to postpone consideration of the New Jersey Plan and instead consider simply revising the Articles. You can imagine the sort of “uh” going around the room: oh, no. Now at this point, Alexander Hamilton stood up and made a dramatic move. On June 18, he made what some describe as a six-hour speech — I can’t imagine giving or listening to a six-hour speech — in which he proposed his plan of government, which as you’ll hear, is really, really, really, really centralized and national. Basically, Hamilton’s plan reduced the states to administrative subdivisions. Each would have a supreme executive appointed by the national government; a chief executive elected for life during good behavior, elected by electors who were elected by electors who were popularly chosen. Okay. How removed can we get the people [laughs] from the process of choosing the executive? Hamilton also proposed a senate chosen for life during good behavior and an executive with absolute veto power. Okay. That’s way out there in scary land. You can imagine — he gives a six-hour speech and that’s what he comes up with. He also during the speech praised the British government as the best government on the face of the earth. Right? [laughter] That’s Hamilton. So basically Hamilton never lives down this speech. As a delegate later put it, Hamilton’s dramatic speech was “praised by everybody, but supported by none.” [laughs] It was like: thank you; you can sit down now. And it really did haunt him to the end of his days because it seemed to be eternal proof to anybody who even vaguely didn’t like him that he was really a monarchist at heart — that he’s just waiting for a chance to convert the government into a monarchy with a king at its head. It’s — You can see why it was important to keep the proceedings secret and you can see how they did not get — remain a secret for very long. Right? Clearly they leaked. If — this is like the tin can tied to Hamilton’s reputation for the rest of his life. Clearly it’s leaking, but — yeah, he never lived down that speech. Now the question is: why did he stand up and give that speech? Why did he stand up and praise the British government as being the best government on the face of the earth? Why did he propose this extreme plan knowing how people felt about some of these ideas? And there is disagreement; there is not agreement on this. Some historians assume that this was a strategic move, and that Hamilton was trying to push the Convention past the weak New Jersey Plan or, horror or horrors, just revising the Articles. So according to this strategy, Hamilton’s plan would have looked so extreme that the Virginia Plan would look really good in comparison, and sure enough not that long after Hamilton’s speech, the New Jersey Plan is defeated, so if this is why Hamilton did this, maybe you could say it worked. However, it’s equally possible that Hamilton wanted at least a moment to stand up and offer his ideas and basically state, ‘Okay. Here’s my plan of government. Here’s my little moment to shine. Here’s what I think we should be doing.’ And I always feel — I don’t which of these is true or not true. I think either one could be or actually both could be, but certainly the latter theory has a little credence to it only because you have to feel sorry for Hamilton at the Convention. Here is this guy who for roughly a decade has been saying we need a stronger national government. He’s one of the first; he’s one of the strongest; he’s consistent; he’s out there; this is his message. He finally gets the Constitutional Convention and the other two delegates from New York do not like the idea of really strengthening the national government very much — and it’s one state, one vote, so basically his vote doesn’t matter at all. So, this poor guy. It’s like: ‘my mission, my mission; hey, finally I’m here and… I can’t do anything.’ And it’s like: aw, poor guy. So it’s possible that he did actually stand up and say, ‘Okay, whatever. Here’s what I would do [laughs] — and I’m going to announce this and never live it down — but here’s what I would do during this, what should be my prime moment.’ So for one reason or another — who knows whether it was strategic or because he wanted his moment to lay out his plan — the fact is that that night after he gave the amazing speech he did meet with Madison and revise Madison’s notes so that they would be an accurate reflection of what he said just in case anyone didn’t hear him praise the British government as the finest on the face of the earth. [laughter] Okay. So a little truth in both, I think. Now I’m about to do a really, really grave injustice to the Constitution, and so now is the moment when the Founders will be spinning in their graves, because I’m going to basically condense my discussion of the Constitution down to three main issues, not because they’re the only issues that should be discussed, but because certainly they’re all important issues, and because they show something about how concerns — issues — of the Revolution continued to play a role in American politics and in American public life. I apologize to all Founders for condensing the Constitution down into mere minutes. Okay. The first issue that I want to discuss is representation. And the question here, the obvious one: population or one state, one vote. Small state, big state battle. Small states are afraid of having no influence, which they continue to be afraid of. This is not a battle that stops once this decision is made. It continues on, and in one way or another states are always sort of objecting. There’s a secession — potential secession plot by New England in the early nineteenth century because they feel that they have no influence. So this doesn’t go away, but certainly at this point it’s a real sticking point. And ultimately a committee came up with a solution, which is known either as the Great Compromise or the Connecticut Compromise, and the reason why it’s the Connecticut Compromise is because it was proposed by Connecticut delegate Roger Sherman. Roger Sherman is a local boy. Yet again New Haven appears on the map. Roger Sherman lived in New Haven and actually — You may have not have noticed it because I’m probably the geek who notices every historical plaque in the universe, but on the front of the Union League CafÃÂ© there actually is a plaque to Roger Sherman. It was his house. Here was his house and here is what he did and we like Roger Sherman. So he’s a New Haven guy. He’s the guy who proposes the Connecticut Compromise and basically, as you could predict, the compromise says representation in the lower house will be based on population and in the upper house one state, one vote. And that gets passed on July 16, 1787. So representation, first major issue. Second major issue — although in a way the problem with this one is that it was not a major issue — is the question of slavery, which clearly is linked to the question of representation. On August 8, Northern states attacked slavery on moral grounds and proposed taking no account of slaves as part of the population when allocating representation in the national legislature. Now obviously many Southerners did not like this idea and they defended slavery on moral and economic grounds, and they were joined by some Northerners who were afraid that this issue was just going to dissolve the Union. Wow. That’s a statement — a strong statement. Other side of the argument: Charles Pinckney of South Carolina was among those who stood up and tried to justify slavery. An example of his argument: He said, “If slavery be wrong, it is justified by the example of all the world. … In all ages one half of mankind have been slaves.” And he cited Greece and Rome and other ancient city-states, as well as sanctions given to slavery in modern times. So slavery is mentioned, slavery has its moment of debate, but it is important to note, it was in a sense a little more than a moment. It only occupied a few days. The issue was recognized to be a deal breaker, and when the delegates held up their concern over slavery against the idea of forming a Union — so basically when they saw that if they really confront the issue of slavery, they may never get a chance to confront the issue of union — they just decided not to confront the issue at all. And they memorialized their inability to confront the issue in the document, the Constitution itself, in Article I, Section 9 of the Constitution, and Article I deals with Congress. It states that, quote, “The Migration or Importation of such Persons as any of the States now existing shall think proper to admit, shall not be prohibited by the Congress prior to the Year one thousand eight hundred and eight” — which basically says Congress can’t stop the slave trade before 1808. But look at how indirect that language is. Right? It doesn’t say what I just said in very simple terms. The “Importation of such Persons as any one of the States shall think proper to admit.” Can there be a more indirect way of referring to slavery? They’re tap dancing around this issue. They’re finding one way or another just not to confront it, so the word “slave” — the word “slavery” — does not appear in the Constitution. So basically faced with a pretty fundamental moral problem, the delegates to the Constitutional Convention looked the other way. In their minds, the Union was too tenuous for anything this controversial to be addressed, and this kind of sort of skipping out or not confronting the issue because it seems like the deal-breaker would be seen again and again and again, and obviously eventually it becomes the deal-breaker and it does contribute to the breaking of the Union. Okay. So representation, slavery, two large issues under debate or not under debate depending on which one you’re talking about. The third issue I want to bring up concerned the national executive, and obviously that really had links to the Revolution. The Revolution was a revolt against strong centralized power in the form of a monarchy and a monarch. We’ve seen in previous lectures how state constitutions that were created in the 1770s really showed this ongoing fear of tyrannical centralized executive power. So we’ve seen, when we were looking at those state constitutions, how more often than not legislatures were given more power and governors were denied some power. It’s the same fear, the same spirit that’s charging the debate during the Convention. So questions about the national executive came up again and again. How should he be elected? By electors? By electors chosen by state legislatures? By state governors? By the national legislature? By popular election? How long should he serve? Proposals ranged from two years to life during good behavior. The ultimate compromise suggested that the President would serve for a four-year term and it didn’t set a limit on how often he could be reelected. And he would be elected by electors in the separate states, which reassured delegates who were worried about state rights — and each state could decide for itself how to select its electors. So if a state wanted to select electors by popular election, they could. If a state wanted to have their legislature pick electors, they could. Again, they’re sort of allowing the states to come up with their own way of doing this. States still have rights. But still, big, scary issue of the executive. So in a way this — all of these sort of compromises and decisions end up creating an executive who — at least it felt like he was being controlled in some way every four years by having to face election. Now in some ways, considering everything that I just said about being scared of monarchy, kings, America sort of slipping right back into a monarchy, this executive is granted a surprising amount of power. He’s Commander in Chief of the armed forces. He could carry on diplomacy. He could recommend measures to Congress. He could exercise a veto, although obviously it could be overturned by a two-thirds vote in each house of Congress. Part of the reason for this amount of trust in the executive was the idea of checks and balances. So people really actually did believe in checks and balances and think that this isn’t a single executive, sort of scary and alone with no way to check his power — that the Constitution actually seems to be kind of nicely balanced, so that maybe this person actually has some restraints or some reins pulling him in. Now obviously this is the — I’m — I feel so bad. Hamilton, Madison — I’m so sorry. This is the most vast overgeneralization of the Constitution that I can almost possibly imagine, and I will come back to it because we have to get it ratified, which is part of what we’re going to do on Tuesday. But in the interest of time: on September 16, 1787, the Constitution was agreed upon. On September 17, it was signed and sent to the Confederation Congress to pass along to the individual states so that they could ratify it. And there needed to be nine states to ratify the Constitution for it to go into effect, and each state would have its own ratifying convention to decide the issue. So what we’re going to be looking at, at least at the beginning of next Tuesday’s lecture is this second debate, which is: what do we really think about the Constitution? And part of what we’ll be pulling from that is, what kind of a sort of status check does it show us about what Americans are thinking at the time? In what way do the different arguments for and against tell us something about America at that moment? So we’ll see the sort of highly contested debate. We’ll see states that say no and then say yes. Rhode Island is still over here somewhere waiting to see what happens. And it’s really something that people are watching closely. I’ll talk a little bit more about this on Tuesday, but I once again also turn to Ezra Stiles. I’m basically always looking for something that makes this real, so that it’s not just: the document, the debate, the Constitution. So Ezra Stiles’ diary — I love Ezra Stiles’ diary, so I’ll mention it a little bit more on Tuesday. But he talks about what he thinks about what’s going on, and he talks about watching states ratify the Constitution. I’ll mention some of that as well, because it again, shows one guy that’s kind of responding to what’s going on in a really interesting way. I will stop there. I will see you on Tuesday. Have a good weekend.